Gurgaon: Starting 3pm on Friday, the way people travel within new Gurgaon will change. 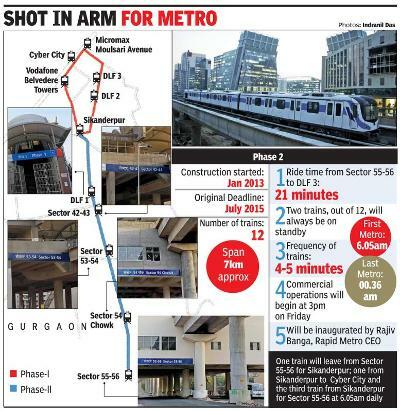 Rapid Metro authorities have announced that commercial operation of the second phase, which connects residential areas in sectors 55-56 to Delhi Metro at Sikanderpur, will begin then. Thursday's announcement came as a huge relief to scores of officegoers, who, till now, were forced to depend on autos and buses. Often, they complain, time taken to reach Sikanderpur from Sector 56 to catch Delhi Metro is more than the time taken to reach south Delhi by Metro. Rapid Metro authorities have claimed this journey will now take only 10-12 minutes. Commuters can use their Delhi Metro smart card to travel in Rapid Metro. Authorities have also taken care to synchronise their timings with Delhi Metro, so that commuters do not lose precious minutes during office rush hour. "We'll begin our operations at 6.05am in three directions. The first train will leave sector 55-56 station for Sikanderpur and then on to Cyber City. The second train will leave Sikanderpur and head towards sector 55-56. The third train will start from Sikanderpur, and carry commuters alighting from Delhi Metro to Cyber City. The same schedule will be repeated at 00.36 hours past midnight, when the last trains leave," said a Rapid Metro official. "To being with, the trains will operate at a frequency of 4-5 minutes. However, this can be increased as per requirement. We have a total of 12 trains, of which two will be kept on standby, to be used whenever frequency needs to be increased. There are two depots right now — one near Cyber City, the other near Sector 54 chowk," the official said. Sector 56 residents are thrilled with the thought they don't have to depend on buses and autos to reach the Metro station. "This announcement could not have come at a better time. With rising temperatures and sweltering heat, it's almost impossible to travel in those rickety autos and buses, which are not dependable. A few months ago, the driver of the bus in which I was travelling to reach home from Sikanderpur, applied brakes suddenly. The impact was such my head hit a rod inside the bus and I almost lost consciousness. The bus and auto drivers are also very rude, and women don't feel safe," said Sujata Singh, a Sector 56 resident. Others complained they dared not use their vehicles to reach Sikanderpur station because of lack of adequate parking. "I was forced to take a bus to reach Metro station. Now that there is a Rapid Metro station 100m from where I live, I don't have to worry about reaching Sikanderpur," said Prateek Sharma, also of Sector 56.